I was thinking about walnut whips the other day, and how great they were when I was a kid. My dad would always bring one back when we stopped at a petrol station. 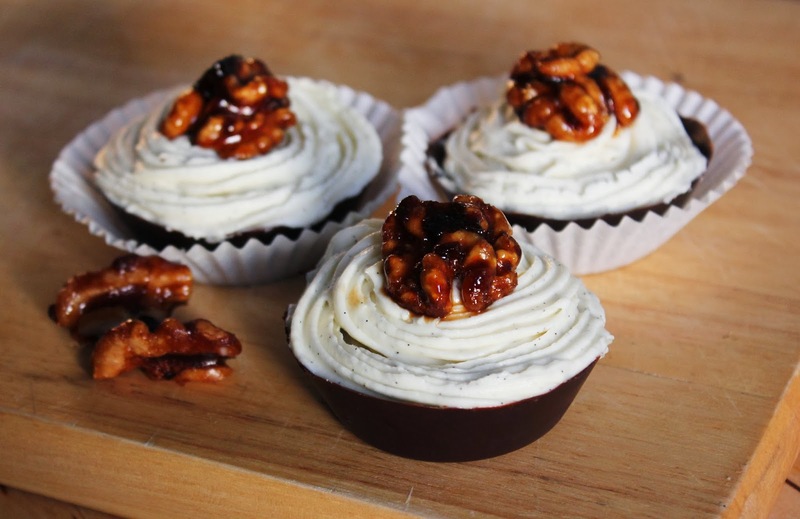 Of course, I then started pondering on how I could get a walnut whip fix, and possibly make them more decadent at the same time. Cue: brandy, and mascarpone and caramelised walnuts; a slightly more sophisticated take on everyone's favourite chocolatey-walnutty classic. What is absolutely essential for this recipe is a silicon tray to make the chocolate shells in: it doesn't need to be a cupcake tray (you might have a fancy chocolate-making one lying around somewhere) but if you don't already have one, go buy one! They're super useful. And then make these. And send some to me. I ate mine already. Break the dark chocolate into pieces and melt it in a bain marie, or in 20 second bursts in the microwave. Using a pastry brush, grease the silicon cupcake cases with the melted butter. Then, brush the moulds with 3/4 of the melted chocolate, making sure you get a thick, even covering on the sides and bottom. Place the tray in the fridge for 15-20 minutes in order to set. Re-melt the remaining chocolate if necessary, and brush an extra layer in all of the moulds, before returning to the fridge for another 15 minutes. Meanwhile, place the mascarpone, icing sugar, vanilla and brandy in a bowl and beat together until well combined. Carefully pop the chocolate shells out of the silicon moulds. You might want to place them in cupcake cases at this point, to avoid them melting when you touch them. Fill a piping bag with the mascarpone mixture, and pipe into the chocolate shells. Place the muscovado sugar along with 1 tbsp water in a small pan and wait until the sugar is melted and bubbling. Drop the walnut halves into the sugar, turning them to ensure an even covering. Spoon out onto a plate or board to set. When ready, top each walnut whip with a caramelised walnut half and sit back to enjoy your (totally not for kids) treat.